#150, fine, tied by a VF strike of NYFM narrow circle of Vs killer (Weiss TR-W4 family) on VF intact external FLS to Holland, JUL 12 (1870) exchange office postmark, docketed p. Str. Holsatia (HAPAG Line), Amsterdam 24 JUL, 1870 receiver on reverse. #114, 2 fine copies, tied by two VF strikes of DETROIT, MI geometric killer and MAR 22 (1870) postmark on VF intact cover to Ontario, Canada, cover with Raw Furs and Skins corner advertisement, 3 mm tear at top affecting nothing. #149, fine, sound, bearing a VF+ SOTN strike of rare NYFM negative NYPO ("New York Post Office") killer (Weiss RE-L4). As often the case with the few known examples of this rare killer that was used for only a short period, the letter N is partially filled in due to rapid deterioration. The letters "YPO" are quite distinct. Ex-Kirke. 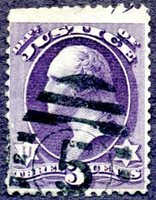 #O27, 3¢ Justice, canceled by a VF+ strike of New York City 9-bar numeral 5 ellipse killer. Examples of this style of NYC killer (used 1876-84) on Justice Department are very scarce. 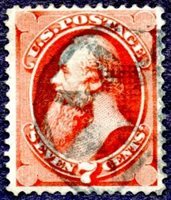 Stamp with corner crease at lower left, trimmed perfs at top. #26, fine, Boston PAID in grid killer with red BOSTON, Ms, APR 3, 1860 postmark on VF intact advertising cover, American Board of Commissioners for Foreign Missions, great map of globe illustration. #65, fine, tied by an XF bold strike of 3-segment fancy wedge killer, fine double circle BRATTLEBORO, VT, OCT 6, 1863 postmark on VF intact cover. Brattleboro is well known for fancy cancels, this unlisted in Skinner-Eno. Rare. 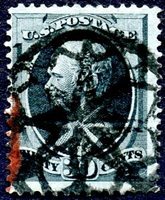 #U10 on buff, VF, neatly opened at left, canceled by an XF strike of a large 5-ring target simplex killer with RIPON, Wis., MAR 4, 1861 postmark, to Hastings, MN. Very unusual killer variety for this period and quite eye catching. Stampless envelope, VF,bearing a superb strike of COLERAIN, O [Ohio], 8hMo/19 Quaker dated postmark and sans serif FREE with J. [Joshua] Maule, PM signature, to Jacob Maule, c/o Susan Hansworth, Philadelphia, PA. Tiny envelope reduction at right just touching the address. Scarce. 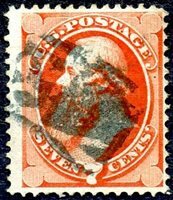 #24, fine, fresh and sound, bearing a VF+ strike of red New York City PAID over U.S. MAIL CITY DELIVERY double circle with thick numeral 1 (cent) rate value (similar to Skinner-Eno PM-CR 1), FEB 16 date. Red cancel on blue stamp, very pretty. #113, F-VF, SE, bearing asuperb SOTN strike of a negative star killer. 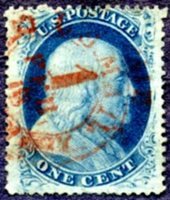 Stamp with a couple trivial corner bends at UR and BL. A terrifically eye-catching item. #252, fine, Boston South End A, MASS., 1895 flag cancel ties to XF illustrated advertising cover for H.F. Sparrow, Cambridgeport, picturing 4 sparrow birds eating a box of chocolates. A beautiful confectioner advertising cover. #UO7, VF, fresh and intact 3¢ Post Office entire, canceled by an XF strike of negative 5-point star with PITTSBURGH, PA, JUL 26 postmark. #UX5, fine, canceled by F-VF WASH. & RICH. R.P.O. DAY, OCT 28, 1880 railway postmark (Towle & Meyer 305-T-3, early use), mailed to Bruxelles, Belgium (receiver on front), bearing a jumbo gem uncancelled #182 paying additional 1¢ for 2¢ UPU rate. #138, VF copy, fine NYFM star killer (Weiss ST-8P2), fresh and bright. Stamp has tiny pressed out corner perf crease at lower right but is otherwise sound. I believe that this stamp is quite possibly a #138A with scarce I grill (Scott catalog $1,400), but because the grill impression is not quite complete it might be difficult to get it certified as such. Pretty stamp. Stampless envelope, VF and intact, bearing a superb strike of PLEASANT GROVE, Md., ALLEGANY CO, MAR 16 (1853) postmark, manuscript "Free E. S. Zevely P.M." at upper right, letter addressed to Zevely's sister, Sophia in Salem, NC. The letter proposes exchange of family daguerreotype images. 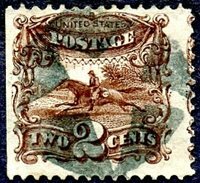 An exceptional example of this very scarce county-name Pleasant Grove postmark of Zevely manufacture and great exhibit item. #O20, 12¢ Interior, XF-superb and sound with light cancellation, this being the scarce catalog-listed variety with short transfer at bottom right (pos. 6). Great stamp. #O21, 15¢ Interior, F-VF+, sound, bearing a superb SOTN strike of intense black cross fancy killer. German WW I occupation of Belgium overprint issue card (5 Centime overprint) with matching stamp, postmarked Brussel, 11-12/23 VII/1915 to Rotterdam, Holland. Appropriate censor markings. #165, F+, sound, firm perfs all around, bearing an XF-superb strike of NYFM star geometric killer (Weiss GE-EP 9) and partial red exchange office postmark at left edge. A gorgeous high value NYFM fancy cancel, ex-Kirke. 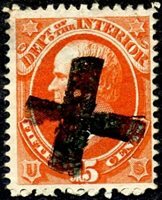 #158, fine, sound, tied by a F-VF+ strike of intense blue negative star with internal pentagram containing a cross (Berg NSP-3) with matching CHICAGO, ILL., 24 DEC (1873) postmark on intact canary corner advertising cover. #UX3, canceled by a F-VF strike of "OK" in circle (Cole OK-16) killer with fair NOV 3 (1874) BELOIT, WI postmark, Crim and Starkweather Bankers printed receipt card on reverse. #406, fine, Providence, RI 1913 flag cancel ties to VF illustrated advertising cover for Walnut Garage, picturing a high end convertible coach coach automobile. Quite attractive. 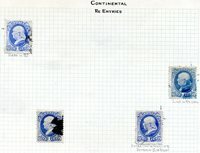 #156, a selection of 12 used plate varieties laid out and annotated on grid paper by a collector who appreciated the "fly speck" aspect of stamp production. The "lower label" varieties are particularly nice. #114, VF, canceled by a VF+ SOTN strike of an outline 5-point star fancy killer, source town unknown. An unusual variety of star killer.